Bluetooth speakers are a very niche type of product. Everyone expects them to be cheap since they are so small and portable, but the truth is that it takes a lot of effort to build a good unit. Today we are going to show you what $50 will get you, and exactly what to expect from speakers in that price range. We have also prepared a selection of models that represent the best in this segment. By the time you’re done with this guide, you should have a good idea of what a good affordable Bluetooth speaker should look like. A robust design which will take all the punishment. Great sound coming from pretty capable drivers. An integrated subwoofer which actually works. Good battery life that allows for plenty of use. Not the most attractive thing out there. One of the most popular uses for Bluetooth speakers is some outdoor fun. Because of that, these speakers need to be able to handle some wear and tear. 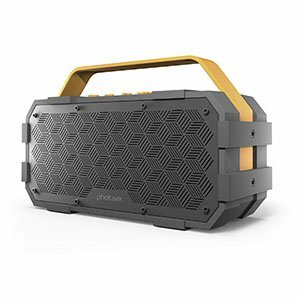 Photive M90 Portable Waterproof Bluetooth Speaker currently represents the absolute best choice you have on the market in this price range. We are talking great features paired with good performance for cheap. What makes it so good is the fact that it comes with a fully waterproof and shock absorbing chassis. On top of that it packs a subwoofer which is small but pretty powerful For a 20 Watt setup, it is quite surprising. Battery life is at 10 hours per charge, which is more than enough for care free daily use. Compact build that is easy to use and quite aesthetic. Comes packed with a decent set of drivers. An awesome 24 hour battery life makes all the difference. IPX6 protection makes it a durable little speaker. Not a particularly loud speaker. VAVA is one of the brands that has been taking over the market for the lower end wireless speakers. 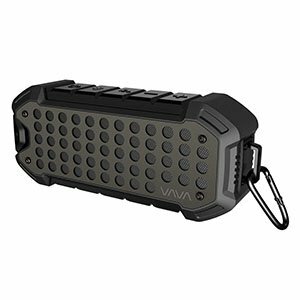 One of the more rugged models in their offer goes under the name of VAVA VOOM 23 Outdoor Rugged Wireless Portable Speaker. With this one, you are looking at a very capable little package that will follow you wherever you go. It is a low power speaker which may discourage some, however it is on par with the industry average. Where it excels is the IPX6 protection and the 24 hour battery life. In other words, this is a perfect choice for camping or any outdoor work. Although not water resistant, it is splash proof. For most that’s more than enough. One of the more stylish designs on the market currently. Comes loaded with awesome features including voice prompt. Great set of speakers that have plenty of range. Good battery life and overall power. Lack of any kind of protection is disappointing. 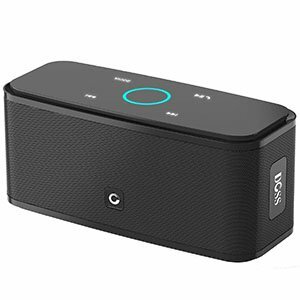 TaoTronics is no stranger to the portable Bluetooth speaker market. As a matter of fact, their wireless earbuds are some of the best out there. 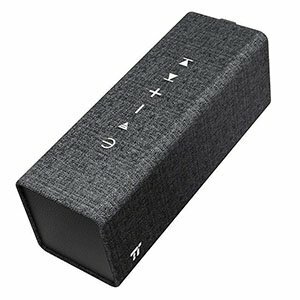 When it comes to speakers, TaoTronics Rock Bluetooth Speaker makes a mighty fine argument for this brand especially if you are on a budget. It isn’t necessarily something you would take surfing, but it works. 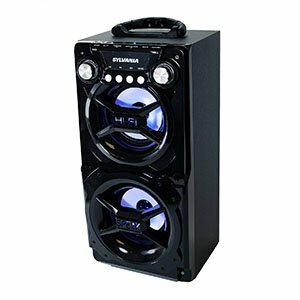 Compared to most outdoor speakers, this one is more or less a stylish model that is meant for casual use. It’s not water resistant nor does it feature a shock proof chassis. However, with two 8 Watt speakers, a built in mic and voice prompts, it more than makes up for it. Battery life of 24 also helps a bit. A very simple and neutral design that just works. Great selection of hardware which include three speakers. Decent battery life with fast charging times. Good volume for such a small setup. Lacks any IP rating which may be an issue outdoors. When it comes to good Bluetooth speakers for both home and outdoor use, DOSS Touch Wireless Bluetooth V4.0 is a great choice. Even though they haven’t done much to make it bulletproof, DOSS did a good job at cramming as much performance as they could in a very small chassis. Because of that, this speaker is among the best. On the inside you will find two quality drivers which are facing the front of the speaker. What really makes it great is the fact that it comes with a bass driver which is facing down. This then gives you decent bass even outdoors. 12 Watts ain’t much but it gets the job done, especially with a 12 hour battery. One of the most most proven designs in this segment. Great set of drivers and overall hardware. Impressive battery life which makes it a perfect outdoor speaker. Built in microphone which works rather well. If there is one brand out there which really needs no special introduction, it is Anker. They have been making some of the absolute best wireless speakers on the market for years. 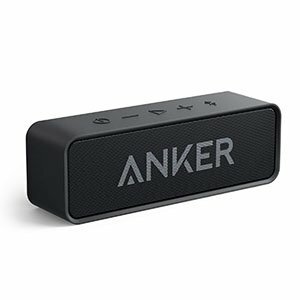 Anker Soundcore Bluetooth Speaker is one of their more popular models and for a good reason. This bad boy brings you everything you could need and then some. The whole thing is centered around a decent set of drivers. These are capable of offering good sound that has range to it. The volume is limited due to its size but it is quite decent. On top of that, you’re looking at a 24 hour battery life and a good built in microphone. That’s plenty good for this price. A functional chassis that really makes it easy for use. Comes with plenty of volume thanks to good speakers. Good sound quality all around. Features 12 hours of battery life on average. Outdoor speakers are really becoming more and more popular these days. One of the models which we really think deserves a mention in the budget class is the OontZ Angle 3. It may not be the most capable model on the market but it sure packs a mean punch for the price you are asked to pay for it currently. Its triangular chassis makes it easy to use while its complement of speakers give it quite a good sound profile. This unit feature IPX5 protection and a custom bass radiator. Although it isn’t a true bass, it still gives you some low end width. With a battery life of 12 hours, it’s a pretty competitive little setup to have outdoors. An unusual design that has been proven to work. Impressive I/O cluster which includes rare options. Plenty of power for such a tiny package. Great battery life to tie it all down. Its tubular chassis is not the best choice. Affordable wireless speakers come in shapes and sizes. That’s the beauty of this tech. You can find just about anything you need these days. 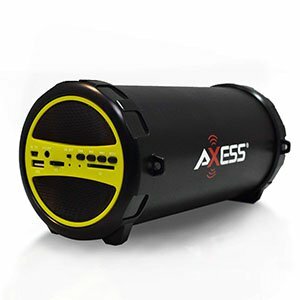 AXESS SPBT1031 Portable Bluetooth Speaker perfectly represents what we mean. It is a speaker that packs a lot and offers a decent performance on a budget. It does bring some compromises, but nothing that’s deal breaking. One thing that we don’t like is the tubular chassis. It is just too easy to roll around. Aside from that these come with a whole lot of I/O options for you to choose, including an SD Card reader. It also features a quite capable subwoofer paired with two 2Watt drivers. Overall, it’s a good setup for outdoor use. A more conventional design which means conventional features. A decent set of drivers ensures good sound. Plenty of volume for such a small setup. A built in EQ unit is a nice change. Lack of any kind of protection is not optimal. Last but not the least we would like to show you a more conventional type of speaker which just happens to be a Bluetooth wireless setup. We are talking about the Sylvania Portable Bluetooth Speaker and its quite impressive design. It’s one of the rare models which are super easy on the eyes although it all comes down to taste. When it comes to hardware, it is a straight forward deal. They went with an open chassis and exposed drivers. This means that there is very little protection if any. The drivers are 4 inch units and offer a good enough sound for the money. The battery isn’t half bad either. Best of all, it comes with a decent EQ. A proper affordable Bluetooth speaker needs to meet three main requirements. It needs to offer decent audio, be fairly compact, and have a good battery life. The models above all fit that description, but not all $50 speakers will. With that said, you should understand that this segment of the market brings some inherent limitations. For one, there is the size of actual transducers. Most $50 Bluetooth speakers will come with smaller drivers. If you’re looking for something beefier, you will have to check out the $100 price range. Then we have the matter of power. Most affordable Bluetooth speakers are fairly limited in power. You will rarely find anything that offers more than 20 Watts, and that usually peak power. Even so, this segment of the market is home to some of the best bluetooth speakers out there. As counter-intuitive as it may be, models in this segment represent what Bluetooth speakers are all about. To most people, spending a lot of money on these devices is borderline crazy. After all, why would you get a $200 Bluetooth speaker when you can get a good set of bookshelf ones for the same type of money? It all boils down to what your personal preference and requirements. It is also worth mentioning that $50 price range, or there about, is where you will find the best value for your money. Most brands recognize that this segment is the dominant one, and they are doing their best to load the speakers with as much performance as they can. Sometimes these upgrades come in form of aesthetics or even practical solutions. Sure, you will have to invest a bit more if you want really good audio quality, but the speakers in this price range definitely solve the issue of playing music on the go. 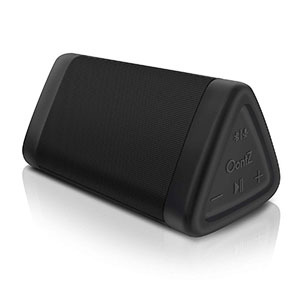 Affordable Bluetooth speakers are becoming more and more capable with each passing day. Technology is moving forward fast enough, while demand for such electronics keeps rising. With that said, the speakers listed above represent the best you can get at the moment. We tried to filter out all of the mediocre speakers and only show you those which stand out in one way or another. If you’re looking for a cheap way to enjoy music where ever you go, we strongly recommend that you check out these speakers. One of them might just be exactly what you’re looking for.